At DIY Conservatories, we specialise in just one thing..... providing our customers with the best quality in easy-fit self build conservatory kits. We are one of the leading specialist suppliers in the world for this product so you can rest assured in the fact that you are buying from a quality supplier. Most of our team here at DIY Conservatories have decades of experience in the conservatory trade, so - between our team, there is very little we can't help you with. We pride ourselves on cutting out all the usual stigma associated with conservatory and window companies by being honest. We feel honesty is the best policy, even if it costs us a few customers. We don't do Summer or Winter sales, or fake discounts. 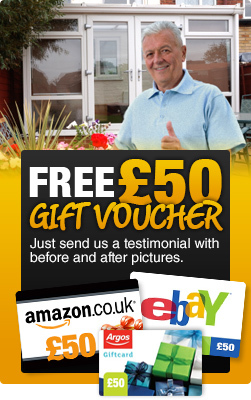 We just offer our best price, first time, every time all year round. Our easy-fit self build conservatory systems cost more to manufacture but are much easier to install. Many other suppliers sell the standard product that national companies install. They are MUCH harder to fit and need professional fitters. Of course they don't tell you this and customers don't realise until they are too far in to turn back! 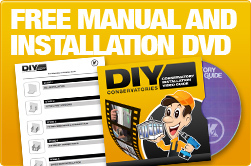 All our conservatory products come with a step-by-step complete guide to installation on DVD and paper. So rest assured you will have the reference materials you need. If you have any technical or installation queries after you buy or during fitting, there is a technical helpline available to answer any of your questions. 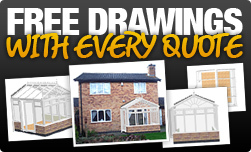 As soon as you complete our online quote form, we won't bombard you with sales calls, we will simply calculate your 'exact price' and send you your online quote and free conservatory drawings by e-mail. If you chose to upload a photograph of your property, we will also show you a visualisation of the conservatory super-imposed on your home! We only offer conservatory products from K2, a global PLC company, which means you can rest assured your 10 year guarantee will be there in 10 years time. Convinced? You should be, so why not give us a call on the number at the top of the page, e-mail us here or get an online quote here.